The BT Optio OP 1000HSE & OPW1200HSE order picking range is designed for high-level order picking in narrow aisle storage systems. These versatile trucks can be used with aisle guidance systems or as free-ranging trucks. The BT OP 1000HSE is equipped with an initial lift while the BT OPW1200HSE is equipped with a walk through solution. Capacities are 1000 & 1200 kg respectively. 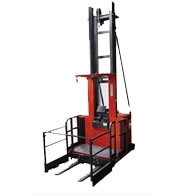 Both machines are available with either duplex or triplex telescopic masts with a max platform height of 9,5 m, enabling picking heights of 11,1 m.
Both trucks feature the BT Optipace system, which electronically optimizes speed, acceleration and braking based on the lift height for maximum performance and safety.